The market for carbonated soft drinks, diet and nondiet, was worth nearly $73 billion in the United States in 2008, according to "Beverage Digest." Many of these beverages contain phosphoric acid, a substance that has a possible link to several health problems. Drinking sodas in moderation might be safe, but if you tend to drink a lot of colas, you might want to rethink your choices the next time you reach for a soda can. Phosphoric acid in its pure form is a colorless, odorless crystal extracted from rocks with sulfuric acid or by burning off elemental phosphorus and adding water to the byproduct. It's a corrosive acid and can form toxic fumes when it comes into contact with alcohols, ketones and other organic compounds. It's used in fertilizers, livestock feed, soaps, polishes, dyes, polishing metals and in many other nonfood products. It's added to soft drinks to provide a sharper, tangy taste and to help slow the growth of molds and bacteria in sugary formulas. When phosphoric acid powders are inhaled or come in contact with skin and other body tissues, it can cause dermatitis, pain, tearing, blurred vision, difficulty swallowing or breathing and gastrointestinal problems. Most of these side effects occur in industrial manufacturing plants where concentrated levels of phosphoric acid are used. The amount of phosphoric acid added to sodas and other foods by comparison is a very small amount. 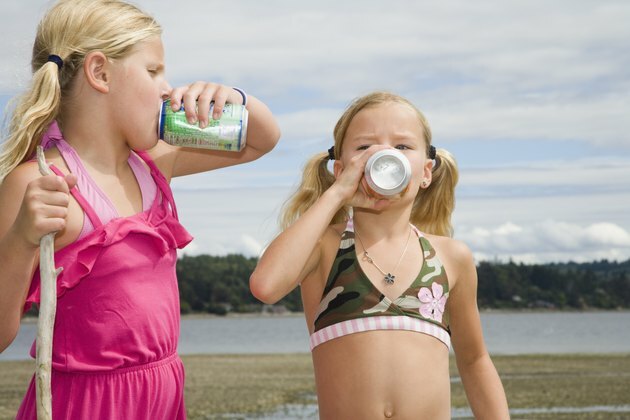 A study published in the "Archives of Pediatric and Adolescent Medicine" in 2000 found that athletic teen girls who consume colas have five times the risk of bone fractures as those who don't consume cola drinks. X-ray tests on 1,672 women in the Framingham Osteoporosis Study between 1996 and 2001 found phosphoric acid-containing colas -- but not clear carbonated soft drinks that use citric acid instead -- were linked to low bone mineral density in women. However, a clinical study at the Creighton University Osteoporosis Research Center, published in 2001 in the "American Journal of Clinical Nutrition," found no impact of carbonated soft drinks with phosphoric acid on calcium excretion in bone and suggested the skeleton effects of carbonated drinks are caused by drinking sodas instead of calcium-containing milk. Dental erosion is one of the major concerns about prolonged exposure of your teeth to acidic beverages. According to a study published in 2007 in "General Dentistry," phosphoric acid in soda causes tooth enamel erosion, even at low levels. The only carbonated beverage that didn't have this effect was a root beer without phosphoric or citric acids. However, most people don't drink sodas for 72 hours, the total time teeth were immersed in the drinks in the study, and the research didn't consider factors such as tooth brushing after drinking sodas or whether the sodas were consumed with a meal or on their own. A team from the National Institutes of Health investigated the dietary habits of 465 people with chronic kidney disease and 467 healthy subjects. The results, published in the journal "Epidemiology" in July 2007, found that drinking two or more colas a day, diet or regular, was associated with a twofold risk of developing kidney disease. The clear sodas that contained citric acid didn't have the same risk. The researchers weren't able to pinpoint an exact cause for the results, although they noted that phosphoric acid has been associated with urinary changes that promote kidney stones.